It has been more than a century since the Mists fell over the Northern Kingdoms, poisoning the land, twisting the minds of those too weak to resist, and bringing fallen warriors back from the dead to raise sword and axe against the living. An age of darkness is approaching and to some all hope seems lost, as the twisting tendrils of a malevolent force tighten their grip on humanity's last bastions. But in the icy realm known as the Valskyrr the fight is far from over. 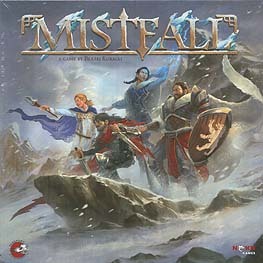 Mistfall is a fully cooperative fantasy adventure played on an ever changing, modular board. As one of the heroes you will have a set of personal feat cards that serve as both your skills and actions, as well as your life pool. Unique advancement cards will allow you to customize your character during the game, building the deck and stacking the cards to create potent combinations or powerful synergies with your companions. Become an iconic fantasy hero and stand against the cruel power of the relentless Mists undertaking one of four diverse quests. Face undead horrors, ravenous beasts, sorcerers, brigands and unspeakable abominations spawned by the malevolent force itself, and vanquish epic foes as you and your companions push forward to complete your mission before time runs out. So gather your companions, your weapons and your resolve and brave the perilous world of Mistfall!